This article contains a comprehensive list of tips that will show you how to type faster, and how to stay healthy and comfortable while you’re doing it. The tips here cover everything from how to improve your typing technique, to how to set up your workspace, to how to decide whether you should change your keyboard layout, and more. While reading this article, remember that you don’t have to implement everything that you read. Instead, try to find a few tips that you think you can benefit from the most, and focus just on them, at least initially. Remember: even implementing a few small tips can make a big difference when it comes to your typing speed and to your health. When you’re typing, try to use the minimal amount of force which is necessary in order to press each key. Don’t strike the keys harder than you need to, since this can reduce your typing speed, and increase the stress that your hands experience while typing. Remember that even though the difference between a light keystroke and a strong one is relatively minor, it adds up significantly over time. Try to keep your hands relatively static while you’re typing. Moving them around too much causes you to slow down and tires out your hands. Note: later in the article, you will see a few ways to minimize how much your hands and fingers move while typing, including modifying your keyboard layout and learning how to touch type. Try to be consistent with which fingers you use to press each key. In general, the greater your consistency, the faster you will type. You can ensure that you’re being consistent by using a specific typing system, such as the traditional touch-typing system, where each finger is responsible for a column of keys, and by keeping your hands relatively static over the keyboard. The only time where being consistent is an issue is when you have a bad habit with regards to typing, such as when you use a specific typing pattern that slows you down or strains your hand somehow. In such cases, you will benefit more in the long term from modifying your typing technique, even if in the short term doing so slows you down and interferes with your ability to type in a consistent manner. While typing, you should be thinking not only about the key that you’re hitting right now, but also about the next few keys that are going to follow it. This will allow you to type without unnecessary pauses, by ensuring that you are always ready to hit the next key in the sequence. Setting up your workspace properly is crucial, since it’s something that’s relatively easy to do, and which can help you type faster, feel more comfortable, and avoid most health issues. Make sure to place the keyboard so that you are centered on the lettered part. Many people center themselves against the full keyboard, including the number pad (which is usually on the right). However, since people mostly use the letters while typing, and only rarely use the number-pad, doing this causes you to work with your body or hands slightly twisted toward the lettered part, which places unnecessary strain on your body. The keyboard should be placed at a height and distance that allows you to keep your elbows at a 90° angle (or at an angle that is slightly greater than that). This reduces the strain on your body, and encourages the use of good posture overall. The keyboard should be placed in a way that allows you to maintain a neutral wrist position while typing. Essentially, you want to make sure that your wrists aren’t angled while you type, either upward or downward, since this places unnecessary strain on them. While working, you should make sure to sit in a way that promotes good posture; this will help you position your hands properly while you type, and is good for your health in general. Your knees should be positioned over your feet and off the chair, and bent at a right angle (or at an angle slightly greater than that). Your pelvis should be rocked forward, and your hips should be at the same height as your knees (or slightly higher). Your lower back should be slightly arched, and properly supported by your chair or by a back cushion with lumbar support. Your upper back should be relaxed and neutral; do not sit hunched forward. Your shoulders and arms should be relaxed, and at your sides. Your neck should be relaxed, and your head should be balancing directly on top of your spine, which should be in a relatively neutral position, without stooping forward or curving backward. Since most of us tend to sit with bad posture, it can be difficult to get used to making so many changes at once. As such, in order to position yourself properly at first, try to go through the above list, and modify each part of your body at a time. Then, while working, check up on yourself from time to time and correct your posture, until you get used to sitting properly. Keep in mind that it’s okay to fidget in your seat occassionally, but try to maintain good posture most of the time. If you feel that you need to stretch, get up from the chair and do it properly, rather than trying to do it while sitting down. Finally, note that the chair that you sit on plays a huge role in your ability to maintain a good posture, and a lot of health issues which stem from bad posture can be solved easily by switching to a better chair. Since you will generally spend a lot of time working in your chair, and since good ergonomic chairs aren’t necessarily expensive, it’s something that’s definitely worth buying. Centered directly in front of you. Placed so that the top part of the screen is approximately at eye level. Placed around 2 feet/60cm away from you. In addition, make sure that the screen is placed so that there is no glare from nearby windows, or from other light sources. If something on the screen is too small for you to view comfortably, don’t lean forward in order to look at it. Instead, use a software-based solution, such as the ‘zoom’ function. Note that if you’re using a laptop and can’t position the screen properly, consider getting a laptop stand, as well as a wireless keyboard and a wireless mouse, which could help you maintain a good posture while you work. As we will see later, an external keyboard and mouse are worth it in general if you work on your laptop a lot, since the built-in keyboard and mouse tend to lead to sub-optimal performance. In general, your forearms and wrists should be fully supported while you’re resting. They should rest in a position that feels natural for your body, and that allows them to relax. A soft resting surface is preferable to a hard one, so if your work surface is hard (e.g. if it’s a glass desk), consider getting a soft desk pad to work on. However, when it comes to whether or not you should let your hands rest on sometimes while you’re typing, the situation is a bit more complex. Some people recommend keeping your arms in the air while typing, and only putting them down when you want to rest. Doing this has the advantage of helping you maintain a neutral wrist position, which is better for you in terms of hand health. However, there are also potential benefits to keeping your arms supported while typing, since this can help you not tire out as fast, and can help ensure that you keep your hands relatively static while typing, which improves your typing speed. Overall, it’s up to you to decide whether you prefer to let your hands float while you’re typing or whether you prefer to let them rest on something. Experiment with both options, and see which one promotes faster typing and helps you avoid wrist pain. If necessary, you can alternate between the two options while you work. This generally means that you should let your hands rest on a comfortable surface during periods when you’re working on the computer and need to type a lot, and that you should let your hands float during periods when you’re working on the computer but you don’t need to type a lot. So far, we saw recommendations for maintaining good posture while sitting, which is the most common way most people work on their computer. However, in some cases you can choose to work while standing instead, which can be better for your overall health. To do this, you can either improvise a stand on which to put your computer, or you could use a specialized standing desk. You can even take this a step further, and work while walking on a treadmill, which offers various health benefits. However, this option is more difficult to implmenet than the ‘standing’ option, and research shows that walking makes it a bit more difficult for you to concentrate on typing, as well as on various other tasks, though the difference in performance compared to sitting or standing is relatively minor. Overall, when deciding whether to sit, stand, or walk while you work, try to find which of these options makes you feel better physically, while also allowing you to maintain a high level of performance. Furthermore, keep in mind that you can shift between the different states if it helps you feel more comfortable. For example, you can decide to sit while you’re working, but to stand up whenever you’re taking a break, which can also be beneficial to your productivity. Most importantly, regardless of how you choose to work, you should make sure to set up your workspace properly, and to maintain a good posture while you work. Doing this while standing or walking is not much different from doing it while sitting, with the only notable difference being the way your legs are placed. Getting yourself a good ergonomic keyboard is an easy way to increase your typing speed and keep your hands healthy, without requiring much effort on your part. You feel that your current keyboard is slowing you down. For example, this might happen if the keyboard is not be responsive enough, or if the keys are too small. You feel that your current keyboard is causing you to strain your hands. For example, this might happen if the keyboard causes you to press keys with a lot of force, or if the keys are placed too close to each other. A common scenario where you might need a new keyboard is if you spend a lot of time working on a laptop, and using the laptop’s built-in keyboard, since the default keyboards that come with most laptops are uncomfortable to type on, and end up slowing you down. Which keyboard is the best one to buy depends on factors such as your personal preference and hand size, so there isn’t one type of keyboard that’s perfect for everyone. Read the relevant technical specifications of the keyboard before you buy it, and check out reviews by previous users. Note that some people recommend using a mechanical keyboard. However, research on the topic suggests that while using a mechanical keyboard could help reduce some hand strain compared to a regular keyboard, it doesn’t usually increase users’ typing speed, and might even reduce it in some cases. Overall, if you want to improve your typing speed and keep your hands healthy while you work, you should consider getting an ergonomic keyboard. Most are not too expensive, and can last you for years. Furthermore, if you suffer from hand pain due to constant computer use, consider also getting an ergonomic mouse, which could help deal with this issue further. Should you change your keyboard layout? Your keyboard layout is the way that the keys on your keyboard are arranged. Some people recommend changing this layout, in order to increase your typing speed and reduce the risk of developing typing-related health problems in your hands. In the next section, we will see what are the most common keyboard layouts, understand when is it worth it to change your keyboard layout, and learn what minor modifications you can make to your keyboard layout, aside from changing it completely. The most common keyboard layouts for English keyboards are QWERTY, Dvorak, and Colemak. Of these, QWERTY is by far the most common layout, since it was the first layout which was introduced to the market, and is now the default layout on the vast majority of keyboards. The Dvorak and Colemak keyboard layouts were developed later, in an effort to create a more efficient keyboard layout than the QWERTY layout, since the QWERTY layout was developed with the goal of overcoming mechanical issues in typewriters, and was consequently inferior from an ergonomic perspective. Minimizing the distance that your fingers travel while typing. Equalizing the use of different fingers while typing. Ensuring there is a constant alternation between the hands and between the fingers while typing. For example, consider the image below, which shows how in the Dvorak layout, the vowels are all typed using the left hand, while most consonants are typed using the right hand, in order to lead to a relatively rhythmic alternation between the hands while typing. Furthermore, the most common letters are placed on the middle (home) row, where the fingers naturally rest, which means that they have to travel a relatively short distance in order to press them. In terms of distance, for example, our fingers travel around 16,000 cm when we use the QWERTY layout, 9,500 cm when we use Dvorak, and 8,000 cm when we use Colemak. 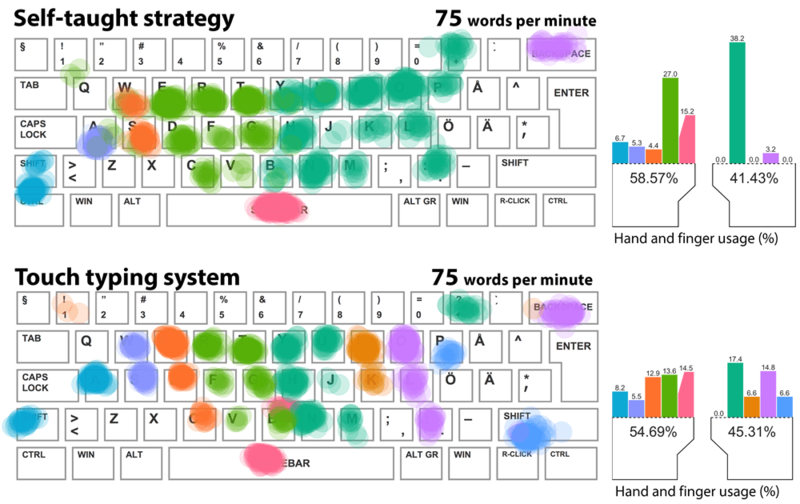 In terms of hand usage, for example, we use the left hand to press around 66% of keys when we use the QWERTY layout, 52% of keys when we use Dvorak, and 56% of keys when we use Colemak. Is it worth it to modify your keyboard layout? Above, we saw that keyboard layouts such as Dvorak and Colemak are superior to the QWERTY layout on various ergonomic metrics, such as distance traveled by the fingers while typing. However, the main question when it comes to deciding whether you should change your keyboard layout is whether this improvement translates to an increased typing speed and to a reduced hand strain in practice. In terms of speed, research on the topic is inconclusive when it comes to determining whether using an alternative keyboard layout enables people to type faster. A potential reason why the ergonomic improvements don’t necessarily translate to an increase in typing speed is that the factors which cause newer layouts to be more efficient might not be the factors which are limiting people’s speed in the first place. Therefore, when deciding whether or not to switch to a new keyboard layout, you should generally not assume that doing so will increase your typing speed, in comparison with learning how to type properly on a QWERTY keyboard. In terms of comfort, however, switching to an alternative keyboard layout can certainly be beneficial, since such layouts are indeed more ergonomic than the default QWERTY layout. Though it’s difficult to conclusively determine whether this difference translates to a reduced likelihood of suffering from hand problems, it’s likely that using such a layout is beneficial, at least to some degree. Beyond speed and comfort, another important factor to take into account when deciding whether to change your keyboard layout is usability, meaning that you should consider how likely you are to be using keyboards that have a different layout in your day to day life. Specifically, since the adoption rate of alternative layouts is so low, you’re unlikely to encounter anything other than the default QWERTY layout when working on public computers or on other people’s devices. This can be an issue if you grow so accustomed to the new layout that you end up struggling to type on QWERTY keyboards. This issue can sometimes be solved if you learn how to touch type using the alternative layout (e.g. Dvorak or Colemak), and if you can easily change the layout on the public computer that you’re using from a software perspective. However, doing this can still be annoying, and pose problems from time to time. Furthermore, keep in mind that changing your keyboard layout also makes it more difficult for other people to work on your computer. This can either be an advantage or a disadvantage, depending on your perspective. Overall, changing your keyboard layout can help you be more comfortable while you type, but you shouldn’t assume that it will translate to a significant increase in typing speed, or to a significant decrease in health problems. If you spend a lot of time typing, learning how to type on an alternative layout might be worth it, but since doing this requires a lot of effort, and since doing it can make it difficult to work on other keyboards, changing your keyboard layout is generally not the first thing you should do if you’re trying to improve your typing speed. While changing your whole keyboard layout is relatively difficult, there are some minor modifications that you can make to your layout, which could result in significant benefits without requiring a lot of effort on your part. For example, you can replace the CapsLock key, which is rarely used, with something more useful, such as the left Ctrl key, which is used more frequently, and which is placed in a more awkward position. While making this type of modifications probably won’t have a significant impact on your typing speed, it could help improve your workflow, and reduce the strain that you experience from inputting awkward key combinations, or from reaching inconveniently placed keys. Should you learn how to touch type? Touch typing involves typing without looking at the keyboard, by relying on muscle memory and hand placement in order to find the necessary keys. Traditionally, touch typing involves placing the eight fingers (thumbs excluded) on the horizontal row in the middle part of the keyboard (the home row), with each finger responsible for pressing only a few keys, as shown below. The typing zones for each finger on a QWERTY keyboard. The keys on the home row are circled. The index fingers are placed on the F and J keys. The little fingers (pinkies) are usually responsible for clicking most modifier keys (e.g. ‘Ctrl’ and ‘Alt’), while the thumb is used to click the ‘Space’ key. Here, for example, we see that the right index finger is responsible for pressing the columns of keys from ‘6’ diagonally down to ‘N’ and from ‘7’ diagonally down to ‘M’. Note that most modern keyboards usually have a raised bar or a dot on the home keys of the index fingers (on the ‘F’ and ‘J’ keys in a QWERTY keyboard), in order to help touch typists identify their position on the keyboard, and align their fingers without looking at the keyboard. Touch typing is usually compared to self-taught typing systems, in which typists use a different combination of fingers to type than in traditional touch typing. People who use these styles of typing usually rely on their index fingers, on their middle fingers, or on some combination of the two in order to type. Self-taught typing strategies are generally referred to as hunt and peck typing, since many people who use them have to look at the keyboard in order to find keys while typing. However, many self-taught typists are capable of typing without looking at the keyboard, by relying on their muscle memory alone, in a manner similar to those who learned how to type using the traditional touch-typing system. However, research on the topic suggests is inconclusive regarding these purported benefits. In terms of hand strain, touch typing has some advantages, since it reduces hand movement, and since it involves a relatively equal use of your fingers (as opposed to relying primarily on your index and middle fingers), both of which are factors that can help reduce the strain that your hands and fingers experience. At the same time, however, touch typing also has some minor disadvantages in terms of hand strain, since it causes you to type some common keys in an uncomfortable manner, and since it sometimes causes you to contort your hand in order to enter certain key combinations. Furthermore, another disadvantage of the traditional touch-typing system is that it usually requires conscious practice, without which most people’s touch-typing skills tend to erode over time. Overall, learning to type without looking at the keyboard can be highly beneficial to your typing speed and workflow. If you struggle to do this naturally, you could potentially benefit from learning the traditional style of touch typing. However, if you are already a relatively fast typist, and if you can already type without looking at the keyboard, then you will likely not benefit much from learning how to touch type using the traditional touch-typing system. As such, when it comes to increasing your typing speed, your main focus should be on learning how to type without looking at the keyboard, which can either involve the traditional touch-typing system or not, based on your personal preferences and capabilities. 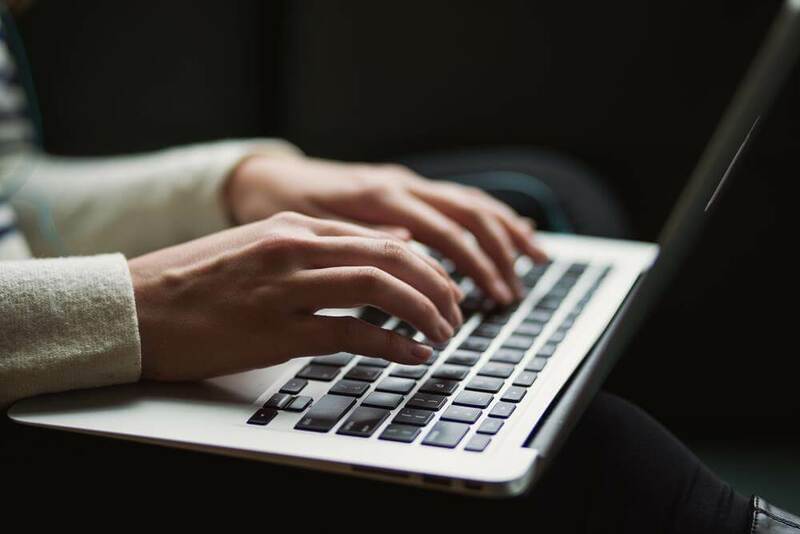 In order to learn how to touch type using the traditional system, you can look for free courses and software online, which could help you train your touch-typing skills. However, in the long term, your ability to touch type will depend primarily on whether or not you continue to type this way when you’re on the computer. As such, if you want to learn how to touch type using the traditional system, the simplest way to do it is to simply place your hands on the appropriate position on the keyboard, as we saw above, and to start typing, while ensuring that each finger presses only its designated keys. At first, you will have to look at the keyboard while doing this, but over time you should develop the necessary muscle memory to type without looking at the keyboard. Keep in mind that learning how to touch type might be frustrating initially, especially if you were relatively proficient in your previous typing style. As with any other skill, touch typing will take a while for you to master, so it’s important to stick with it. Finally, if you decide that you want to learn how to touch type, then you should make sure t0 start by focusing on accuracy, rather than on speed, since your goal at first is to develop the necessary muscle memory. If you stick with it, then your typing speed will increase over time, as you adapt to this new mode of typing. If you don’t want to learn how to touch type using the traditional touch-typing system, but you do want to improve your typing technique and learn how to type faster, there are still some beneficial things that you can take from this system in order to supplement your own typing style. First, you can decide to learn how to type without looking at the keyboard. As we saw earlier, many people who don’t use the traditional touch-typing system are capable of typing without looking at the keyboard, by relying on their muscle memory and hand placement alone. You can learn how to do this by simply training yourself to type without looking at the keyboard. The difference between doing this and between learning the traditional touch-typing system is that here you should only focus on typing without looking at the keyboard, while in the traditional touch-typing system you need to focus on learning which finger needs to press which key. Though this might be difficult to accomplish at first, it can be easier to learn how to do this than to learn the traditional touch-typing system, and it can still help you type more quickly. Another thing that you can do it learn to use a hybrid typing style. This involves integrating certain aspects of the traditional touch-typing system into your own typing style, in a way that helps you type more quickly, without requiring as much effort as learning the full touch-typing system. For example, if you tend to rely primarily on your dominant hand while typing, you could divide the keyboard equally between both your hands while typing, which will allow you type faster, while also reducing the strain on your dominant hand. Finally, you can also make minor modifications to your typing style. Doing this involves making relatively minor modifications to your typing technique, which can help make a big difference to your typing speed, without requiring much effort on your part. For example, you can start using your thumbs in order to hit the space bar, instead of using your middle or index fingers. This kind of modification is easy to make, and it can help you significantly improve your typing speed. Overall, even if you don’t want to learn the traditional touch-typing system, you can benefit from borrowing some aspects of it in order to improve your own typing style. Doing this can help you type faster and reduce the strain on your hands, and doesn’t require as much effort as learning the full touch-typing system. Repetitive strain injuries (RSI) are injuries that occur as a result of minor repetitive actions, such as typing and mouse clicking, whose impact accumulates over time. RSI is painful, and if left untreated can become debilitating, to the point where you struggle to close your hand and grip regular objects. Poor posture and body alignment. Overuse of the keyboard or mouse. So far in the article, we saw how you can improve your typing technique and your posture/body alignment, which can help you significantly reduce the risk of suffering from RSI. With regards to these two factors, another thing that you can do in order to reduce the strain on your hands is to avoid contorting them when you’re typing combinations of keys. For example, combinations such as ‘Ctrl + Z’ and ‘Ctrl + T’ can cause a lot of strain if you type them using the same hand. As such, if you need to type such key combinations, try to do so by using both hands at the same time. For instance, if you need to input the ‘Ctrl + Z’ combination, try pressing the right ‘Ctrl’ button with your right hand, and the ‘Z’ key with your left hand. In addition, if you experience pain in a specific part of your hand or in a specific finger, try to avoid moving it too much, to reduce the strain on it. For example, if you have pain in your wrist, try to move your whole arm while typing, instead of the wrist itself. Make sure that your hands are warmed up before you start typing. Make sure that your work environment isn’t too cold. Fully relax and rest your hands when you’re not actively using them. Use breaks in order to stretch your hands properly. If you are suffering from weak muscles in your hands, you should strengthen your hands and fingers by using therapy putty, stress balls, training bands, hand grippers, finger grippers, or Chinese exercise balls. In a pinch, many of these tools can be improvised using household items, such as a rolled-up pair of socks or a generic rubber band. You can also benefit from more general types of exercise, such as pull-ups and weightlifting, though these obviously requires more work on your part. Finally, remember that when it comes to RSI, the most important factor to consider is overuse of the part of your body that is suffering from excessive strain. You can reduce the amount of strain that you experience from typing by improving your typing technique and your posture, and you can increase your body’s ability to handle that strain by solving any issues that you have with tight or weak muscles. However, at the end of the day, the more you use your hands and fingers in order to type and use the computer, the higher the likelihood that you will suffer from RSI. Therefore, if you reach a point where you start experiencing RSI, you will likely have to reduce the amount of typing and clicking that you do, by changing the way you use the computer. For example, you can decide to replace some emails with phone calls where possible. Similarly, you can choose to dedicate more time to planning what you are going to write before you write it, in order to reduce the need for editing later. In addition, if your hands need rest, you could benefit from using voice-recognition software instead of typing manually. This is especially beneficial if you need time to recover from RSI, but still need to use your computer a lot. Using voice-recognition software can also be beneficial in general, and some people find it easier to dictate their thoughts to the software while walking around than to type those thoughts by hand. Obviously, this isn’t ideal for everyone, but some people find that it works well for them. You can save a lot of time while working and reduce the strain on your hands by learning how to use some basic keyboard shortcuts, which are combinations of keys that when clicked together allow you to activate a certain feature within a program. To find helpful keyboard shortcuts, simply search for the name of the software that you work with, together with the term “keyboard shortcuts” or “useful keyboard shortcuts”. If you want to learn how to accomplish a specific action by using a shortcut, insert a description of that action into the search string (e.g. “Microsoft Word keyboard shortcut print document”). Don’t start out by trying to learn so many keyboard shortcuts that you become overwhelmed and can’t remember any of them. Instead, focus on the ones that you can use the most at first, and once you get used to them, add a few others that can help. In addition to shortcuts, you can also consider using computer macros, which are short sequences of keystrokes or mouse clicks that activate a longer series of actions in an automatic manner. Macros generally take longer to set up than keyboard shortcuts, but they can save you a lot of time, especially if you tend to perform the same tasks repeatedly. Similarly to finding relevant shortcuts, you can simply search online for guides on how to set up the macros that you need. Your search string should contain the word “macro”, together with the name of the software that you are using, as well as a description of the function that you are trying to perform. Dealing with typos and minor errors while you’re writing can interrupt your workflow and hinder your ability to think about what you want to write. Therefore, in some cases (depending on what you’re writing), you can benefit from choosing to ignore typos during the writing process, and instead deal with them later, during the editing stage. You can even take this a step further, and decide to completely avoid reading the text during the initial writing stage, aside from occasionally checking it to make sure that everything is working properly. This allows you to focus only on thinking about what you want to say, and allows you to establish a “flow”, without the temptation to focus on editing at this stage. However, some people may find that this hinders their writing process, so it’s a matter of personal preference whether or not to implement this. You want to avoid being in a low-energy state, where you’re feeling tired or bored. You can do this by solving whatever issue is causing you to have low energy levels. For example, you can eat something if you’re hungry, or listen to some energizing music if you’re bored. You want to avoid being in a negative state of mind, where you’re feeling angry or nervous. If you feel that you can’t concentrate on the task at hand because of these emotions, try to take a short break, and come back to the task once you’ve relaxed a little. Overall, you want to be in a state where you are calm and focused on your work. This is beneficial not only for your typing speed, but also for your productivity in general. In this guide, you saw various tips which can help you improve your typing speed and reduce the strain on your hands. Some of these tips are relatively easy to implement, while others require more effort. At the same time, some of these tips will have a big impact on your typing speed, while others will have only a minor impact. Since some of these tips can be too difficult for you to implement, and since there isn’t necessarily a relationship between how difficult a certain tip is to implement and how much it will increase your typing speed, your goal shouldn’t be to try and implement everything at once. Rather, you should look at all of the tips, and focus on those that will give you the best return in terms of typing speed and health, compared to the cost and effort involved in implementing them. In order to measure how different modifications affect your typing speed, you can test your performance over time using an online typing test. If you do this, then you should make sure to measure your performance using the same method consistently, while controlling for background factors such as the location where you are taking the test and how tired you are while taking it. When testing your performance, you can also check the average typing speed on that test, in order to get an idea of how good your typing speed is compared to that of the average person. However, keep in mind that there will often be a heavy selection bias in those results, since the people who take typing tests tend to care more about their typing speed than the average person, and so they are likely to be faster typists. As such, testing your performance is beneficial mostly if you find that you’re already typing so fast naturally that there isn’t much point in changing your current typing style, since you likely won’t be able to improve your current speed by much. Otherwise, the main purpose of testing your performance is to see whether the modifications that you make can help you increase your typing speed compared to your baseline typing speed. Furthermore, you can also benefit from checking whether the new regimen is helping you reduce discomfort and pain in your hands. Of course, this measurement is more subjective (as opposed to objective measurements such as typing speed), which makes it more difficult to track. However, you can still try to do this, for example by creating a spreadsheet where you rate, on a scale of 1-5, how well you felt at the end of the day, in terms of hand comfort. Finally, if you end up testing your performance over time, remember that it’s okay if you struggle to improve at first. This is a natural part of the learning process, and with practice, positive changes that you implement will become an instinctive part of the way you type. This article shows you how to improve your typing speed, and how to work in a way that helps you stay healthy and comfortable. When deciding which tips to focus on, start with those that are the easiest for you to implement, and which will benefit you the most. To improve your general typing technique, you should use a light touch when typing, avoid moving your hands around unnecessarily, know what you are about to type next, and maintain consistency in your typing patterns. You should set up your workspace properly, and maintain good posture while you work. This involves a number of things, including centering yourself on the lettered part of the keyboard, maintaining a neutral wrist position while typing, sitting properly, and getting a good ergonomic keyboard. Changing your keyboard layout from the default QWERTY layout to an alternative layout such as Dvorak or Colemak can be beneficial in some cases, but most people will primarily benefit from making only minor modifications to their keyboard layout. Similarly, learning the traditional touch-typing system can be beneficial for some people, but most people will benefit more from borrowing only specific aspects of this system. To reduce the likelihood of suffering from pain and discomfort while you type, you should make sure to use good typing technique and to maintain proper body alignment while you work. In addition, you could also benefit from properly stretching your hands, strengthening them, and allowing them to have proper breaks when necessary.